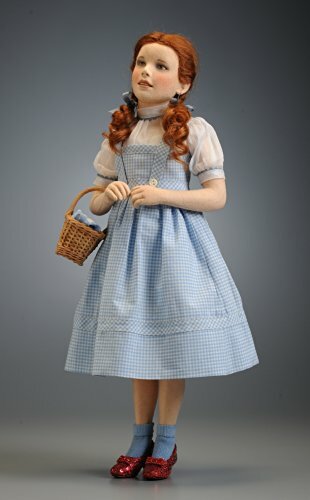 R John Wright Dorothy Gale is the latest addition to our exciting series based on the characters from the classic MGM motion picture The Wizard of Oz!? Dorothy has been vividly brought to life by R. JOHN WRIGHT DOLLS for the first time in the medium of molded felt. Standing 16 1/2" tall, Dorothy is fully jointed at shoulders, hips and neck with the R. John Wright ball & socket jointing system with internal wood mechanism. She has a realistic molded felt torso and limbs and her lovely hands have individual fingers. The compelling portrait face is finely modeled in a true likeness with delicate hand painted features. Dorothy's meticulously hand-knotted wig is made of the finest custom-dyed mohair and precisely styled. Oz's beloved heroine is outfitted in the trademark costume consisting of a blouse of fine Italian cotton organdy with custom-dyed rickrack trim, period undergarments, and a pinafore dress tailored of imported blue checked cotton fabric. The dress is exactly patterned after the original design by famed MGM costumer, Adrian, with authentic A-line styling and includes such details as the hidden pocket in seam! On her feet, she wears custom-made cotton anklets and detailed miniature replicas of the iconic Ruby Slippers - hand cobbled out of fine leather and covered in micro sequins, rhinestones, and faceted crystals. On one arm, Dorothy carries a custom made miniature of the actual basket in the film with checkered napkin inside. No effort has been spared to make this the most authentic version of this beloved character ever produced.